How do you take a small story and make it big? The 55-minute film has been selected as one of three winners in the documentary category of the 2011 College Television Awards, informally known as the “Student Emmy Awards.” Corrao and Salomone, both enrolled in Wake Forest’s new master of fine arts in documentary film program, will travel to Los Angeles for the April 9 ceremony, where they will find out if their film wins first, second or third place. For student documentary filmmakers, this is one of the most prestigious national awards. 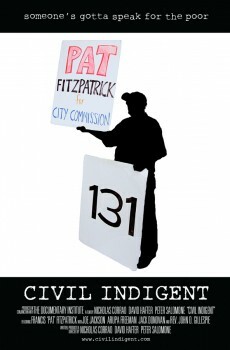 Set in Gainesville, Fla., the film follows Francis “Pat” Fitzpatrick as he leads the fight against a local law imposing a meal limit on a homeless shelter downtown. From his protests at City Hall to his campaign for a seat on the City Commission, the film documents his controversial advocacy for the homeless. The film, which took more than a year to complete, is about one person, but focuses on a larger issue. Geared toward the DVD and television markets, their hope is the film will also be distributed to organizations that serve the poor and the homeless and to educators addressing these societal issues. The film was screened on campus in October before the filmmakers had finalized the musical score and completed the color corrections. On April 11, their completed film will be shown at the New Orleans International Human Rights Film Festival. “You can really see their craftsmanship from the quality of their shooting, the design of their story themes and the compelling nature of their editing,” said Sandy Dickson, co-director of Wake Forest’s Documentary Film Program. The awards event is designed to connect young filmmakers with producers and distributors who are looking for new, up-and-coming talent. While in Los Angeles, Corrao and Salomone plan to set up additional meetings with film organizations to get the word out about their film. “The greatest thing about the College Television Awards is when we knock on the doors of independent producers and distributors, it catches peoples’ attention immediately,” Salomone said. The film also won the Young Filmmaker Grand Jury Award in late March at the Gasparilla International Film Festival in Tampa. They are in the process of submitting it for the Student Academy Awards. The pair began work on “Civil Indigent” when they were students at the University of Florida Documentary Institute and finished it at Wake Forest. David Hafter, a fellow University of Florida student, also worked on the project.